Always dreamed of travelling the world but don't exactly have a jet-setter's bank account? Never fear – with a TUIFly voucher you can enjoy amazing savings on cheap flights to exciting destinations across the globe. From quick jaunts across to Europe to long-haul adventures to exotic places like South East Asia and the Caribbean, the TUIFly online shop lets you browse cheap flights from a range of budget airlines to find the very best deals. Originally set up to act as the company website and online booking platform for budget airline TUIFly, in 2010 the TUIFly online shop transformed itself into an online booking agency selling flights for a number of low cost airlines travelling to destinations around the world. Now it's a one-stop-shop for travellers and holidaymakers looking to expand their horizons without spending a fortune. TUIFly allows customers to easily search and book cheap flights from budget airlines such as TUIFly, Air Berlin, Germanwings, Condor, Lufthansa, Germania, Air VIA Airways, InterSky, Pegasus, Sun Express, Transavia, Corendon Airlines, Belair Airlines, Hamburg Airways and Niki. Through their unique and innovative search facilities, customers can find the very best deals for their journey – and even combine several deals into one booking, perfect for those travelling long haul or to multiple destinations. And although all flights are cheap in price, they're provided by internationally known and respected airlines – so you know you won't be sacrificing on quality or safety when you book with TUIFly. TUIFly and its partner airlines offer flights to hundreds of destinations throughout Europe, Asia, Africa, South America and the USA. Want to pick up cheap flights for that romantic city break in Prague or Budapest? Or perhaps you're planning a round-the-world-trip and want the best deals on separate flights spanning several continents? Wherever you're planning on escaping to, TUIFly can help you save money by hunting down the very best fares on your behalf. The TUIFly online shop also offers a wide range of travel extras which you can add to your booking in order to compile your own DIY budget break. As well as pre-arranged package holidays to exciting destinations worldwide, the site also gives customers the opportunity to book low-priced hotels and apartments, car hire, travel insurance and much more. And once you've chosen all the different elements for your dream break, you'll find the booking process simple and secure – getting your holiday booked and paid for in a few clicks of a button. Want to book your next escape with TUIFly? With a TUIFly voucher you can get great deals on budget flights to almost anywhere in the world. So whether you're planning a family holiday or a solo adventure, a TUIFly code will help you save the pennies – leaving you more to spend while you're away. South America and the USA. Browse our website until you find a TUIFly voucher that suits you, then navigate to their website to begin browsing. Enter your desired travel details and click 'Find flights'. Click on a flight for more information then click 'Continue' to book. Choose any additional extras and click 'Continue'. Enter your TUIFly code in the box provided and click 'Redeem'. If you've enjoyed shopping for budget flights with TUIFly, why not spend some time browsing more great deals on places to stay around the world with sites like Booking.com and Hotels.com? Or, if those aren't right for you, you'll find plenty more stores in our Travel section. Navigate to their website to begin browsing. Enter your TUIFly voucher in the box provided and click 'Redeem'. Enter your billing and payment details and click 'Book and pay' to complete your booking. Need to contact the team at TUIFly? Whether you have a question about your booking, want to know more about the company's package holiday deals or simply want to find out how you could be making big savings at the TUIFly online shop, you can contact the Customer Services department by telephoning 020 7048 0143. Want to find out more about travelling the world on a budget with TUIFly? The company maintains a profile across all your favourite social media networks. Follow them for travel tips, special offers, competitions and much more. You can also use these pages to find out more about saving money with a TUIFly voucher. Don’t forget to check them regularly, as you can never be sure when a free TUIFly code might be waiting for you! Buy now online at www.tuifly.com/en/index.html. I love to travel, and one of my favourite things to do is book a budget flight to explore a new city. With the TUIFly voucher code I found online, I can get great deals with a choice of budget airlines to destinations all around the world. 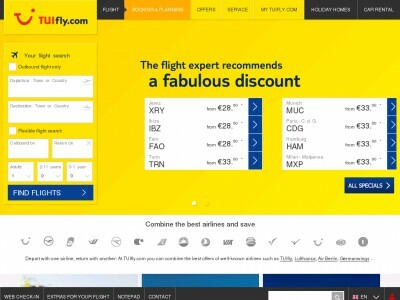 I just visit the TUIFly online shop at tuifly.com, enter my TUIFly code and see what flights are available. It's a great way to get cheap flights and explore off the beaten path – all thanks to a TUIFly voucher code. So why not see where the TUIFly online shop can take you?